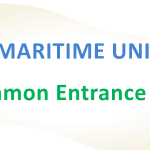 Indian Maritime University is the sole body when it comes to imparting education related to the maritime sector. Over the years, nation was feeling a need of centralized university to cater all the latest needs and demands of workforce. And hence IMU was born. IMU conducts Common Entrance Test (CET) to take candidates for various courses. Read more about imu cet 2019. B Tech Marine Engineering 4 year program. There is a separate CET for M.B.A, M.TECH and L.L.M. 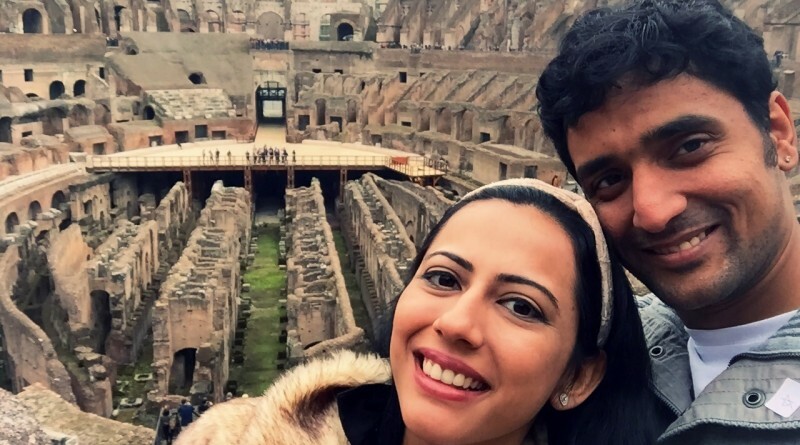 Currently they have five campuses: Kochi, Chennai, Vishakhapatnam, Mumbai, Kolkata. Read there are several colleges which are affiliated to the Indian maritime university. For more details read this: Indian Maritime University. First University conducts a common entrance exam called as imu cet and then after those candidates who are selected are called for counseling or GD or PI as per the course applied. Candidates must make sure that, they comply with all the eligibility. B) B.Sc (Any of these Physics/ Mathematics/ Chemistry/ Electronics) passed candidates with 55 % marks. C) B.tech candidates with 50 % in English. Note: Candidates applying for DNS, needs to have passport before the admission. 2) B.Sc- 3 years- 60% (PCM) and 50% (English) in 12th Class. For B.Sc in Ship Building and Repair only 50% in PCM. 3) B Tech Marine Engineering/Naval Architecture – 60%(PCM) and 50% (English) in 12th Class. 2nd Year lateral entry candidates should have pursued Marine or Mechanical or Naval Architecture or Electrical in diploma. Note: Lateral Entry in to B.tech program is still in process by the IMU and no admission will be there till further notice. 4) PG Diploma in Marine Engineering- 50 % in B.tech/ B.E course or program. 5) M Tech Naval Architecture and Ocean Engineering- 60 % in B.tech in Mechanical /Civil Aeronautical/Marine/ Naval Architecture. 6) MBA- 50 % with any stream. 7) LLM (Maritime Law)- 50% in any law degree. B.Sc or DNS courses– Rs 2,20,000/- for Boys and 140,500/- for Female cadets per year. B.Tech Courses– Rs 225000/- for Boys and 140500/- for Female cadets per year. B Sc Ship Building and Repair– Rs 220000/- for both male and female cadets per year. B Tech Naval Architecture– Rs 225000/- for both male and female cadets per year. M.Tech Courses– 225000/- for male and female cadets per year. PH.D Course– Rs 10000/- per year. PGDME (GME)– Rs 300000/- for whole course. Candidates who are applying for all these courses needs to comply with medical standards of D.G Shipping. And they have to go through a medical examination, before appearing for the counseling. One can see all the latest guidelines about medical standards www.dgshipping.com. Medical standards are different for several courses that are offered by the indian maritime university. A candidate who is in General category needs to have age not greater than 25 years at time of applying. For reserved category students like SC/ST and PD- Not more than 30 years of age. For SC candidates- 15% Quota. For OBC candidates- 27 % should be part of Non Creamy layer. Note: Any candidate who is applying for the reserved category should have valid caste certificate as per government of India. Also as per the new reservation for the upper caste economically weaker sections will also apply. Candidate needs to be aware about the fact that, all the questions asked in this exam are as per what taught to the students in their 12th class. Multiple choice questions are asked in this exam. Time Duration- 180 minutes or 3 hours. Subjects- Mathematics, Physics, Chemistry, General Knowledge, English and Aptitude. 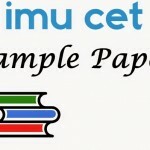 Here you can find sample paper for imu cet. candidates needs to enter the bank details. After application form is complete, a printout needs to be taken for future reference. These documents should be attached with application form during filling up. As an age proof attach high school passing certificate or whatever that has date of birth. 12th class passing certificate. Pursuing candidates needs to provide it during counseling. Provisional degree in case candidate has passed graduation. NOTE:ONLY SOFTCOPY OF ALL DOCUMENTS NEEDS TO BE ATTACHED. sir i was having maths as additional subject, will i be able to sit for the exam????? If you markheet has marks of maths written on it, then you can give the exam. I have scored less than 60% in pcm in 12th. Can i atleast give imucet no matters i get or not can i appeare fot it? i have passed 12th with pcm. i got 60% . but with nios can i still appply…..? sir, how can i fill imu cet 2014 form? plz reply fast. First of all forms will come in February month. As soon as notification comes, you just have to follow instructions. sir, i got notification that imu cet 2014 form for feb batch has been released and last for submission is 10th dec.
but on their official website there is no any cet form. Better you contact IMU chennai office as not much time is left. sir wat is d startin sallery n jobs offered if we want to do BTECH in marine engineering…. what type of medical certificate needed???? 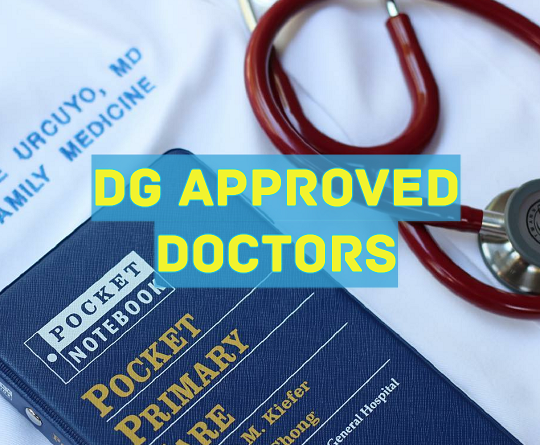 A DG Approved medical doctor will make medical certificate. There are many things that are done in it like blood test, urine test, eye test, xray etc. I hav'nt opted for maths in 12th…..can i still appply…..? No You cannot, Maths is necessary. Search on google you will get the the list of D.G. approved doctors.Connect the one which is nearer to you. you can find the list of D.G. approved doctors on google. It is nothing but you have to go to a company whose sponsorship you want. The company will take your test. if you will pass,the company will sponsor you.the company will send you to a collage for b.tech or any other course. you have to pay all your fees.After completing your degree you will get job in that company. sir, does imu cet 2014 the test for studying bsc nautical science???? Yes you can pursue your MBA program. Companies conduct sponsorship, so that after completion of course, cadets can directly be absorbed in their company. Better you visit imu portal, You will get syllabus there. Ive been informed that the IMU CET applications forms for 2014 are closed. Sir is a student is eligible to give IMU cet exam if he is appearing class 2nd time? i am going to attend 12th public exam this year can i write CET ? sir, i am a 12 appearing student with pcm. sir i am searching for application form of imu cet.bt i cant understand when does forms out.plz help me to know the exact date of form declaration. I think forms for this exam can still be filled. please visit imu official site. now i am doing final year mech engg. how i apply for imu cet @ aug batch…. when applications will be issued for mba 2014 in imu? Colleges takes direct admissions to the GME course, but make this sure by contacting IMU chennai. am in final sem of mechanical engg. planning to join pgdme course, do i need to write imucet exam. As per the schedule they should already be in the process being filled up. sir can u tell me application form has been out or not??? They are already being filled up. hello , sir, i have completed 12 stan with 59.8% in 2011… can i apply or not .??? sir i hav completed my 12 stand with 59.8%… can i apply or not???? You May, but in that case you have to see which college accepts this score. Mostly colleges that are affiliated to state universities can accept the score. If you have JEE score, you can contact AMET or Meri Kolkatta, they may be accepting the score card. sir i wearing spectacles. Can i apply for marine engineering? Yes You can, but there is a limitation for power of your glass. Just see the prospectus to know more. Sir IMU CET application form is not available in that site. How do we apply for that sir? I have given my 12 boards this year,how to get admission in b.tech marine engg. 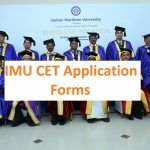 You have to apply for IMU CET. imu cet ke through lateral entry hoti h kya.?? Yes lateral entry to second year are always there. Sir whats this lateral entry? Students who have done diploma, will get entry into 2nd year of the marine engineering directly. But process of this is well known to IMU, so please contact them. Forms are already being filled for the AUG batch. Form should come online in the month April, probably 2nd second week. Exam will be held on 14th June 2014. As far as books are concerned, you need to contact local book shop. Please tell if you need any more information. Yes, since IMU CET is not so big exam in terms of students applying for it, study material is hard to find for it. Right now we are not planning to make one. So best is to search net for such material. Also you will get three model papers free, when you will register for application. Please like our FB page, for news and updates on IMU CET. Please see the above comment. In that case, you should better drop a mail to the IMU cell and tell them your problem. They will surely help you, as you have done the payment successfully. their is no form avilable for aug batch 2014 marine engnering. Sir the application form for b-tech is not available in the site. Can you please let me know where i can find the form and when is the last date for applying? when its application form will be available nd what is its fees , kindly tell about its fees structure !!!! Hope u reply sooonnn !!! Applications will be filled in the month of April. About fees, we are not sure. But last year it was Rs 1000. Fee structure for each course is given above. But this fees may change. Don't forget like us, as it will help other students also. Feel free to ask any doubt. Entire information is given above article. Please follow that, and if still you have doubt, you can post it in comment. See if you have 60 % in PCM, then surely you can apply for IMU CET 2014. SIR I PASSED 12TH WITH PCM 81.33 AND ENG 59 HOW TO APPLY COMPANY SPONSER SHIP PLZ …………………..
See you never know which company is taking sponsorship tests. But yes, you can make list of some of them and then remain touch with them. For instance, synergy maritime takes entrance every year. Can u please tell me about the difficulty level of IMU CET exam for btech ME which will be conducted in June 2014. The level of difficulty is never known to anybody, but yes, if you have read good for boards and is preparing for some engineering entrance, then surely you will get a boost. Also, like our FB page for new updates. i dnt have d req, aggregate for PCM in 12th but i have 61% in my final year of Bsc(maths) m i eligible to apply for IMU cet ?? and when will the forms be out ? Since you have done B.Sc, you can go for Lateral entry, no need of 12th marks. Lateral entry means, you will get admission in to 2nd year directly. But the clear process for it can only be known by contacting IMU. So, contact with them, and share your knowledge with us, as it will help other students also. Thanks and like our FB page for more updates. For DNS, yes you need to have passport. Because your CDC is applied in very short time. You need to have 50% at least in English. Sir still applicatioln form for IMU CET exam is not available in website. What I can do? Wait for sometime as form may come in one week time. Sir, Is it compulsory to get sponsored? I mean, I want to join SCI Mumbai so applying CET is enough right? I have 83 % in PCM and 94 in English. Is it possible to get an admission in Sci? I belong to SC too. You marks are very good. Candidates who are taking 1 year nautical course needs to get sponsored. SCI, have their own maritime college. Yes if you perform good, you can get admission. I gave the exam of 12th this year,so I don't have my passing now. We are not getting what is AIU CET. sir ,i m roshan i have appeared 12th last month i want to give imu cet exam.when will the date of examination? The exam is scheduled to be conducted on 14th June 2014.
please tell me the name of the book which i could buy from the market for imu cet 2014..and also tell me the cut off marks of previous exam of imu cet .. Exactly we don't know which book to go for, as only few books are available in the market. Only Book stores that are near to the maritime academies can have the books related to it. T" please help me out sir. From this it looks like you cannot give the exam. But you have a option of opting for the management seats that some private colleges have. You can visit the official site of IMU. i wanted to know about the dates for application forms of Mtech course in naval architecture and ocean engineering..there is no info available on the official imu website. Now the forms for M.TECH course can be filled online. sir, i m saroj , i have appeared this year intermediate; still awaiting of result, it will published on last may. i hope will scored about 75% marks in pcm. would i eligible for the imu cet 2014 aug batch for dns. can i apply form or not? plz sir help me. Yes you are eligible for IMU CET. Forms are already being filled by the candidates. Like us to get more update on this exam. Please ask any doubt, if you have one. Forms are already being filled up at official portal. sir please help me out of these…..
Have you also deposited fees for the form? On our FB page, you will find the email address of IMU. Contact at that email and tell your problem. Tell us what they said. Sir I am going to write my ISC exams in March 2015. when exactly am I supposed to get my form for CET(considering that I want to go for 4 year marine engineering B.Tech course). What is the criteria for JEE MAINS? am I required to sit for both CET and JEE MAINS? Well if you are giving your 12th class exam in 2015, then you have to apply for cet in 2015. No, you just have to sit in IMU CET for taking admission in to marine engineering. i'm kikanshu from m.p .I have completed 12th in 2013 with pcm aggregate 61% ,and english 81, i want to apply for imucet 2014 when will the form made available. And what are the scope after having b.tech(marine engg.) from imu and what are the campus, salary. . . ? Kindly response as early as possible. Welcome to our portal. Well forms are already being filled at the IMU portal. B.tech marine engineering is all about ship machinery. First you will join as trainee after completing your B.tech. Salary are good in merchant navy and varies as per rank and company. If you have more doubt, please contact. Like our FB page for more updates on this exam. Sir I did my 12 in 2009 ….in pcm 70% and in eng 80%…gap year from study is 4 years…can I apply fr the bsc nautical science?? My d.o.b: is 31 jan 1992.
can I aplly for imu cet 2014??? Well you can apply for this exam, but it would be better if you can tell us, in which stream you have done your engineering. Sir m nt doing any engineering n nt any stdy….so sir if I 'll clear the cet exam…….can I get admiision in bsc nautical science?? If you have not done any course in these 4 years, then you are not eligible for this exam. If you would have done any graduation course or diploma, then in that case you were eligible. Sir, if I am appearing for ba 2 yr……..can I eligible??????? My name is Abhay . i passed 12th in 2012 ….i want t know that after MBA in shipping ,how much sallary i got from start. Well MBA pass-outs will deal with all management work related to shipping like HR department, logistics etc. Well salary is surely more than other sectors and chance to work abroad is also more. But we can't tell exact figure of salary. Well yes you can give the exam. But make sure you appeared in boards last year, not before that. And like our page for more updates on FB. Sir can you please elaborate what you said? I passed 12th board in 2013 and improved in 2014 but didnt get 60% in PCM due to some problem. Can i give IMU 2014 and fill roll no of 2nd time repeating and tell them that result is awaited? I saw on their site that there is no restriction on number of attempts if candidate is less than 24 years at time of giving IMU CEt. 'To appear in Computer-based CET 2014, a candidate must have either passed the qualifying examination in the first attempt on or after 1st August, 2012 or should be appearing in it for the first time in 2014. Those who are going to appear in the qualifying examination later than 31st May 2014 are not eligible to appear in Computer-based CET 2014'. Welcome to marinersgalaxy. Yes you can apply for it if you have appeared for improvement papers. Sir I had 52% marks in Pcm nd 69%in english May I eligible to apply? Yes you are eligible for this exam, but only for few courses. We already have plenty of articles about these, please go through them. Can you please tell us your PCM percentage. Sir, please guide me i have 47.3 % in PCM but in english i have 72% marks…. Your PCM percentage are little bit less here, at least you should have 50%. For nautical courses, You need to have 6/6 eyes. Sir can you please send me online application form link..
Just visit http://www.imu.edu.in and then, see the lower left side. sir, i passed my 10th exams in 2012 and took admission in a school running under cbse but due to some reasons i failed to manage the courses and dropped the year and again took admission in 11th class with state board and hence i will give my 12th exams next year i.e. 2015. can i apply for imu for b.tech courses next year or there will be an year issue. sir i have passes 12th in the year 2012…can i apply????? please help..
sir, I Pankaj kumar choudhary I had given my 12th exm and I am waiting for my result can I apply if yes than what will be the criteria for filling the marks obtained in physics,chemistry,mathematics and english in the application form .. Yes you can fill the form and appear for imu cet 2014. See we haven't seen the application form, but at the time of counselling you have to show your mark sheet. If you have required PCM %, then they will give you admission, otherwise not. If 0 code says, that your result is awaiting or similar thing, then yes you can go for it. If any more doubt, please revert back. You have to again appear for the IMU CET. what documents are to sent and where? last date to submission of hard copy is? Hello sir, i result for 12th will publish in end of may…i my pcm % could go below 60…but my english marks will be above 80…. As Such there is no sports quota in IMU, but yes, individual colleges can have. Yes you can get admission in DNS. And also your result is still not out, so hope for best. HOW MUCH IS YOUR APPLICATION FEE..? Please be clear in your question. i have completed my b.tech in chemical engineering, so am i eligible to write the exam ? also i have my 10+2 pcm 90% and english 85% how can i apply to this exam now ? Well Yes, You will be eligible for this exam. But, not for the technical courses. You can do DNS. Whats difference (quality wise and otherwise also) between IMU and MERI. Is MERI better? If meri is better then how to get into MERI? Which is better between IMU and tolani ? All are telling that IMU is just another govt college and that it looks good only on paper. How will placement differ with college? I also dont think that my family will be able / will be willing to send me to merchant navy college. Fees is also very high 225000 in just fees + other expenses in IMU and similar at tolani. Please tell me how can i get sponsorship from some reputed company as i can surely score very good in any test. I am asking you because i couldnt find ANY RELIABLE information on the net. No. There are only two attempt chance for IMU. If somebody, has done any graduation course in the idle years, then yes he or she will be eligible for IMU CET. sir, i wanted to know if there is negetive marking for wrong answers in IMU CET 2014? As such there is no mention of negative marking in the official brochure, so we don't think so that there is a negative marking. Well first fill the form for IMU CET. For Marine engineering, you necessarily need not to have sponsorship in the very first year. Sponsorship is necessary to take admission into DNS courses. Cut off varies every year. You have very good marks and hence you are eligible for this exam. Now as far as books are concerned, you have to search them locally, because, unlike other national entrance exams, you don't have a nationalized book for studying it. Hello sir, i am rajeshkumar. i am a b.tech graduate from mechanical branch, my date of birth is in the year 1987 now am i eligible for any admission in naval department in indian naval or other private naval companies . Well You have to see whether you are eligible for CDS, for Indian navy as per your age. And as far as merchant navy is concerned, you can go for GME course. Well try to make payment again. But make sure that, previous payment not resulted in deduction of money from your bank. Sir, will admission to ts chankya will be through jee advance or imu cet or both? I am confused because while searching about t s chankya i get results showing admission through jee adv. for 2013 but no details for 2014. Also it is given that forms are available in syndycate banks main branch but i didn't get it there. Sir, please clearify. Now TS Chanakya has been converted to IMU Mumbai, so you just have to fill the forms of IMU CET. I have passed my 12th this year with 77% in PCM and 84% in english , am i eligible for IMU-CET in 2015 for naval architechture. Sir I want to know, whether Improvement conducted by CBSE is eligible for IMU CET or not..? is there any need to send filled application form to imu acdemic cell or that is for future use ? It is for the future use only. Just drop a mail to the IMU cell. The mail address is there in the brochure. And send all your proofs of payment and application form. Surely they will help you. No need to panic for this. i would just like to clarify on one issue i.e will we be notified by imu the exact address of the center we have selected . .
like if i hv selected mumbai as my center, will i be notified where exactly in mumbai am i suppose to answer my exam ? Yes, your admit card will have the address detail of the exam centre. Yes you are eligible for this exam. Admission through IMU CET is there in these 36 colleges. sir, my eyesight is -2.5. can i still apply for IMU CET ? It Depends for which course you are applying. If it is Deck side, then, you cannot apply. and i am thinking to apply improvement. and i want to know am i eligible to apply in any course of imu. You Should Atleast have 60% Marks in PCM. Mock Tests would have surely helped you and gave some clue about what type of questions are asked. As far as preparations is concerned, refer some standard books, and you may go for some test series for further strengthening your knowledge. Sir..wil i get any sms or mail alert for downloading my admit card..or i have to download it in particular website??.. You will get it at the profile that you created during filling of IMU forms. IMU will make download of admit cards in batches. You will soon be able to download it. Now you might be able to download the admit card. IMU is publishing admit cards in slots. i have successfully filled my application form and submitted(updated the payment details also) as per the screen shots shown on imu cet website. after entering my login id and pass. i see the application details screen(completely filled and updated) still i see a complete online registration process link on the application(p.s : i have already completed my registration way b4 20th) . . and i cannot see/ download my hall ticket. Does imu take time to update the hall tickets or i have committed some mistake in my form ? Yes, IMU is publishing Admit card in Batches. On IMU website there is a link to download hall ticket but on signing in the application form is shown not hall ticket. What's this? Is there any problem in there site or i have done any mistake? IMU is publishing admit cards in slots, so this is the reason, why everyone cannot download on same day. Soon, they will publish yours also. Well it depends on the cut off, and it changes every year. sir im aakash…. syllabus for IMU CET is only 12th class science? 11th class syllabus is not included in the exam? Well in entrance exams, questions from both 11th and 12th class syllabus are asked. I am In My Final Year Of B.tech(ECE) I Have Scored 70+ In My 10th And 12th Cleared My AIEEE Exam In Year 2011 . Now My Queries Is What I Have To Do To Join Merchant Navy Jobs Is I am Eligible For Direct Jobs Or I Have To Do Some Courses Before Applying (if So Pls Specified The Course Name) My Present Age Is 22 . <>. And If I Want To Sponsor My Future Education On MY Own is There Is Any Way For It Pls Tell Me About The 2 Case And Also If My Age Will Cause Any Problem If I Go for Merchant Navy. It depends for which course you want to apply. what is passing criteria after any company has sponshered in IMUCET exam ? Its is same as given above. You should have admit card with you, because 14th JUNE is the exam date. Sir can you please let me know the december dates for IMU CET and when will the online application is going to start? Actually i want to apply for DNS course for feb 2015 batch. sir i have done 12 by nios ( national institute of open schooling ) i got 70% . i want to know that i can still apply for IMU ( B.tech Marine eng. )..
i have secured a rank of 810 in june imucet 2014 do i stand a chance of getting admission into imu kolkata chennai or mumbai campuses. Yes you might get. But that will depend on flow of students towards different courses. Competition can be stiff. Well in good college, it won't be possible. But yes chances are there. my rank in imu 2014 is 2297 can i get marine engineering in any government college…. My rank in IMU cet 2014 is 1315 which best course and campus i can get in this rank??? You can go for both B.tech or DNS. You might get IMU campus (Any one). actually iam overweight(mean fat) and i dont have 6/6 vision and i am interested in ship building and repair and naval architect so can this a become reason for my non selection?????? There are many colleges in mumbai like imu mumbai. Counselling will held in july. In this process, you have to choose the college you want. If as per your rank you get college, then you will get admission in that. Yes, may be, as there are plenty of college out there. i appeared for the imucet 14 june 2014.
as i completed my online exam an ERROR appeared on my screen after submitting the paper. my name in not there in the list of students who cleared the exam. i mailed my problem to imu exam cell but they are not replying and neither picking up the phone. i m in trouble sir please help me . i have 85% in my pcm in 12 class in 2014. There is nothing we can do in this, only option is to be in contact with imu authorities. i sooraj s entitled in the imu cet 2014 result list sir i want to known how much seats avail for MBA courses?? sir what we have to do in counselling round??????? sir what we have to do in counselling round??????????????? sir, i am vidit. when will the december form be out? sir when will the december form be out?? I Have done b.tech in electronics and comm. i want to join DNS . Is IMU-CET is mandatory to get admission..and i have not 60% in PCM on 12th std..but i have 60% marks in btech..and i have a drop on 12th …am i eligible for get admission? is it compulsory to give jee exam to take admission in imu university of chennai or there will be separate entrace exa,m of university? i m now stuyding in 12 science . Sir,is there an IMU – CET exam in Dec 2014? If yes,when and where can I apply for it. Can I join the Feb 2015 batch if I appear for this exam. Kindly provide a reply as soon as possible. sir i will be answering my 12th boards on march 2015 can you please tell me that when are the forms for cet imu b tech will be published…. Preparation will be similar to what you are doing for other entrance exams. Dates have not come yet. 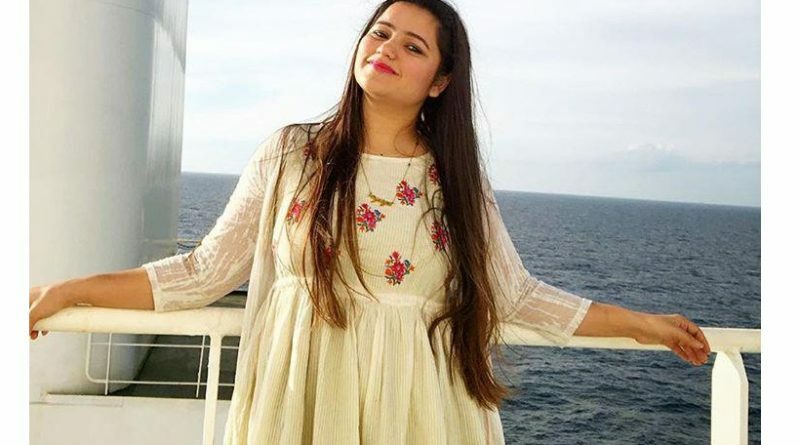 SIR MY SISTER HAS PGDM WHICH IS EQUIVALENT TO MBA AND WANT TO JOIN MERCHANT NAVY PLZ TELL ME HOW SHE CAN ENTER MERCHANT NAVY?? Yes most of the shipping company have openings for MBA students, for various management works. Just drop resumes to various companies like Maersk, MSC, Wallems, Tanker Pacific etc. The list is endless for shipping companies. This might help http://www.marinersgalaxy.com/2013/09/DG-Approved-Shipping-Companies-India.html . Hello sir, i am niket, i have done B.E. from computer science branch, is possible to join ? i hope you can show me way to join marine. You might have to go for Deck course which is of 1 year duration, because only B.E mechanical or ece can come for the engine side. sir my DOB is 01/06/1998, can i apply for feb batch in????? Sir, I am a graduate Electrical Engineer(B.Tech – 2014 pass out). How can I join Merchant Navy??? I want to do 1 year PG diploma in Marine Engineering. Am I eligible for that? You can pursue the ETO course offered by some of the colleges in India. By doing that, you will work as electrical officer onboard ship. am in final sem of mechanical engineering. i wan to join in GME course. in which month i have to apply.is it imu cet is necssary for gme. I am student of 12 th class with subject PCM . So when I can fill the IMU CET entrance test form . Well are you studying or already passed 12th class? If you are studying , then form for imu cet 2015 will come in MAY month. sir i wanted to do DNS course but i am having an eyesight problem of -3.00 in both eyes..what would i do?? is laser operation allowed for this course because after this surgery my eyes will be perfect… but i am in doubt will they accept after lasik or not……… I am passionate of making career in sipping….please suggest some way…. thanks please reply as soon as possible. In the Application Form Salary is asked.But I am currently unemployed.Or ere they ask about ur parent's salary? Is a 12th passed student eligible for dns? Sir,iam a 12th student just gonna to write imu cet.what is the rank i wanna to get in imu cet to get btech marine engineering. Better Rank is under 200. As you will get best maritime college under this rank. Application forms are being filled online, you can go to the Indian Maritime University website. Sir, I just filled a form of imu cet and I am a 12th appearing student , there were 3 courses given in the form ,tht is ug , mba and mtech and I select mtech course by mistake instead of ug course in form , what shall I do now pls help me ?will my form be cancelled or not? I have already filled the form with fees , pls give me some suggestions for making correcting my mistake. sir,i hv appeared for imu cet this year and hopefully i will clear it.i need to know do i have to obtain a medical certificate from a doctor.in case what tests should be mentioned in the certificate??? I would like to know that if i apply for the online counselling in the home site of IMU ,do i still need to apply individually in other colleges for admission? Different colleges are conducting their own entrance test, will i have to qualify in those too to acquire seats in the college ? Sir , I have got compartment in maths in class 12 else I have good marks in other subjects .if I clear the compartment then also am I eligible?? Or if I drop for a year still am I eligible?? sir,I have passed imu cet with 7281 th rank.I passed +2 with 80% marks and pcm with 77%.I have appeared for aema test on may 25th.How will I know that Im qualified.When will I get a notification through email??? hello sir just wanted to know that can i join ts rahaman with sponsorship from msc but not having passport now. course name is dns…. hello sir , please tell me on which date cet exam will be held? i m 12th pass before 2007 . this time i want join merchant navy. please suggest me. Which course you want to pursue and what is your age? They Should Consider Improvement Exam results. In whatever Subjects you think you have less marks. sir, are imucet forms for 2016 feb batch are available or not? is imucet 2016 forms available now?? I have 50% marks in commerce so can i apply bsc in imu. plz tell me about this. hello sir, i'm shivam ,persuing b.tech 3rd year in electronics & comm. branch. what are the courses to be done after the completion of my b.tech program for being in shipping companies?? Sir, I have 59.3% PCM marks and 94 marks in English in my 12th CBSE exams. Am I eligible for B.Sc. (NAUTICAL SCIENCE) in IMU CET. PLEASE REPLY.Thank you. sir i am studing final year EEE dimploma course in govt. college . Can i apply to IMU Cet to join any branch into 2nd year by way of lateral entry. please guide the procedures to apply and fee structre and colleges where existed. Sir i have got 59% in pcm. And i wanted to do either bsc ns or dns . sir its my dream to become a sailor Will i be able to take admission in any of the imu affiliated colleges or any other . Sir can i give the next imu cet . And wat about if i cracked the cet will i be able to take admission in any of th imu colleges . . ?? Sir, I am perusing my final b.com degree and I want to do mba in international logistics management.please Tel me was medical tests are required I am using spectacles too and mba exam pattern and imu cet 2016 mba details.please reply me faster and help me…. Sir how can I apply for imu cet for augut batch?? how are possible to adm in imu. sir i wanted to ask you that now as it is 1 of april . can i fill forms for apperaring in marine exams ? There is always option in the form for those students who have just given 12th exams. Yes you can. It is true that you need to study, when you are pursuing B.tech program, but that does not mean it is meant for bright students only!. A little bit hard work is always needed in order to succeed. Choice is yours. 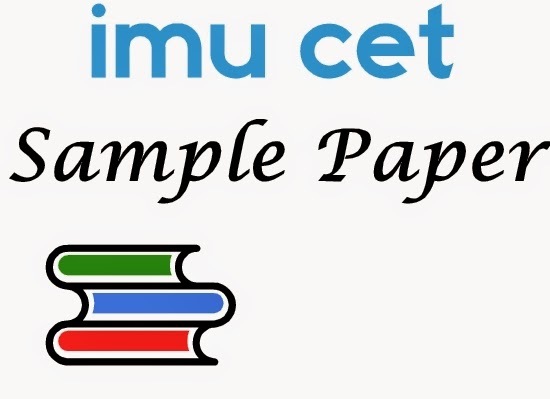 Try imu cet sample papers here. sir this year I m going to appear for 12th BOARDS march examination 2016 so can I apply for IMU exam for Feb. Batch…..??? what marks should i get in imucet ug to rank under 300 (general category)? I have got 70% in chem nd phy each but only 50% in maths . Am i elligible for the test ? I have 55% in 12th. Am i eligible for IMU entrance and also cleared IMU cet ug 2016 but only 55% in 12th plz tell me. sir i got AIR 63 this year after the results got declared …. now what to do..also tell me how do companies take students from the IMU centeres. Sir, I have got 3755 (general) rank in imu cet.2016. plz advice me what i will get b.tech or b.sc and which stream and which college is best for me in this rank. 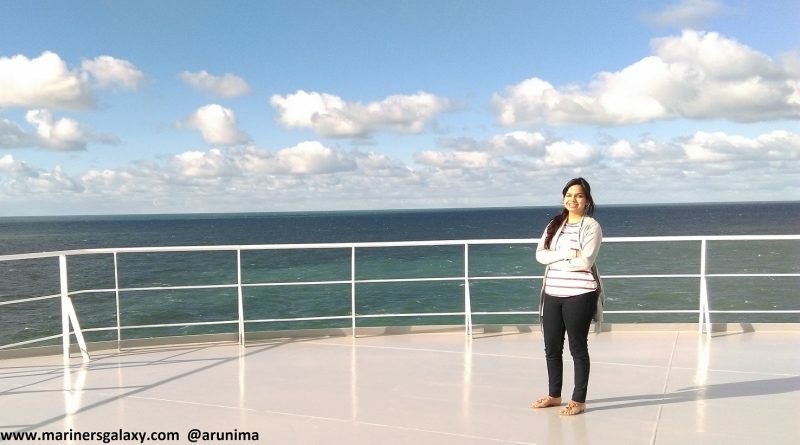 Sir I got 50% in PCM and 72% in English in my 12th boards……can i apply for nautical science?Is there anything i can do because this is really important for me. Sir, i have not given the imu cet exam,bt i have 60% marks in PCM in 12th. Is there any chance for admission in marine engineering?? I had also given the jee mains test. I want to ask the one question When the form declare for btak merin engendering ????????????? I am passed 12th class with RBSE board and sir my pcm marks is 66% sir can i take admission . Humanities (without maths) in 11th & 12th and a BBA-LLB degree (passed with 78%). 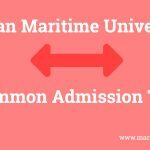 Am I eligible to appear for test for LLM (Maritime Law) ? sir, i have completed A-level in physics, maths and general paper. can i apply sir? I have a question I have got 59% Mark in PCM but I will be giving improvement exam next year am I eligible for b tech in Marine engineering by qualifying Imu cet next year?? Sir I had completed intermediate in 2013. Can I eligible IMU cet for b.tech. marine engineering 2017 ? Where I have no any degree after 12.
sir i had applied for 2016 june imu cet exam.but i couldn’t attend it.so i’m looking for the next imu cet exam this year.can you please give informations about the next imu exam.it would be a great help if you reply. i hv done 3 year diploma from electronics and communication engineering in 2012 after 10th. but according to the board of education the diploma is equivalent to 12 th and i got 60% marks in diploma.I hv read all non medical subject in the first year of diploma like (PCM).Now i m 23 year old and i want to apply for the CET.SO pls suggest me what should i do.And also tell the form applying time.thanks sir i am awaited for ur respective replay. Sir I am weak in English . i belong in poor family .my qualifications is 10+2 by 76 % 2014 .and deo computer course .can I fill the I m u from are not .and which is best course for me pls sir give me your opinions . I am appearing student of 12, will give boards in 2017 with PCB I m non maths can I apply for b.sc courses??? when the application forms for december imu cet 2016 comes.pls let me know asap. Sir please tell me the date of application form. When and how can i fii it. I am having -0.75 power in my both eyes, so I am eligible for the diploma in nautical science course. Sir I am the student of computer science and technology.I am doing diploma can u just tell how can I Join merchant navy. sir i got 89.33% in pcm and 55% i n eng can i eligible for imu. Currently i m doing B.Tech in Mechanical Engineering (7th sem) . Am i eligible for M.Tech program in Naval Arch. or Ocean Engg. ? Sir I am Sujata from jamshedpur. I have filled the imu cet application form this year. Unfortunately i have done a mistake in filling the form. Can i make changes? If yes..please notify me the date. Sir , I got 56% marks in pcm can I get admission in any imu college…?